WHAT IS IT? FunnelWeb air filter is made in Australia and is known for its pyramid-like bumps, dome shape and single layer of single-density polyurethane foam. The funny shape has a purpose, as it increases the outer surface area to almost double that of a conventional air filter. WHAT STANDS OUT? Here’s a list of things that stand out with the FunnelWeb air filter. (1) Theory. 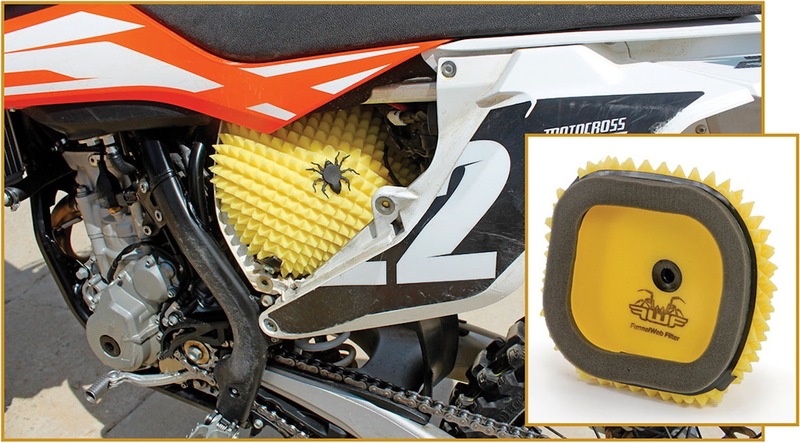 Motocross bikes have used all manner of air filters over the last 60 years. There have been paper filters, fuzzy filters, multi-density filters, domed filters, pleated gauze filters, dual-layer filters, throw-away filters and green weenie filters. Regardless of its shape or construction, the goal of every air filter is to let air in while keeping dirt out. Air filters are one area of motocross development where there is still unlimited potential for creative entrepreneurs, as the FunnelWeb filter shows. (2) Design. The one-piece, pyramid design provides a larger surface area than most filters. Increased surface area allows less dirt to penetrate the foam. It is easy to get confused about the relationship between filter size and airflow. While the FunnelWeb has twice as much surface area on its outer diameter, thanks to the 203 pyramids on the 2016 KTM filter, it is not any larger where the air filter cage mates to the intake tract. No matter how large the outer surface area, the air still must go through the same size intake tract. But all is not lost. The greater surface area of the FunnelWeb means that the chance of airflow being impeded as the filter gets clogged with dirt is reduced. There are more places for the air to get in, and this translates into longer service intervals. (3) Construction. Why does FunnelWeb use a single-density, single-layer foam instead of the dual layers of other air filters? (a) The single-layer foam holds its shape better. (b) The single-layer foam does not get dirt stuck between layers, because there are no layers. (c) FunnelWeb believes that a thicker single layer of foam provides better dirt filtration than a filter that has one dense layer and one porous layer. Additionally, MSR’s FunnelWeb filter is not flame-bonded together; it is sealed with a petroleum-resistant glue instead. (4) Seal. To get the best seal possible between the air filter and the airbox lip, FunnelWeb injection-molds a urethane seal for a tighter fit to support a layer of dense foam seal between the cage and the airbox. MXA still puts grease on the seal for extra security. (5) Performance. 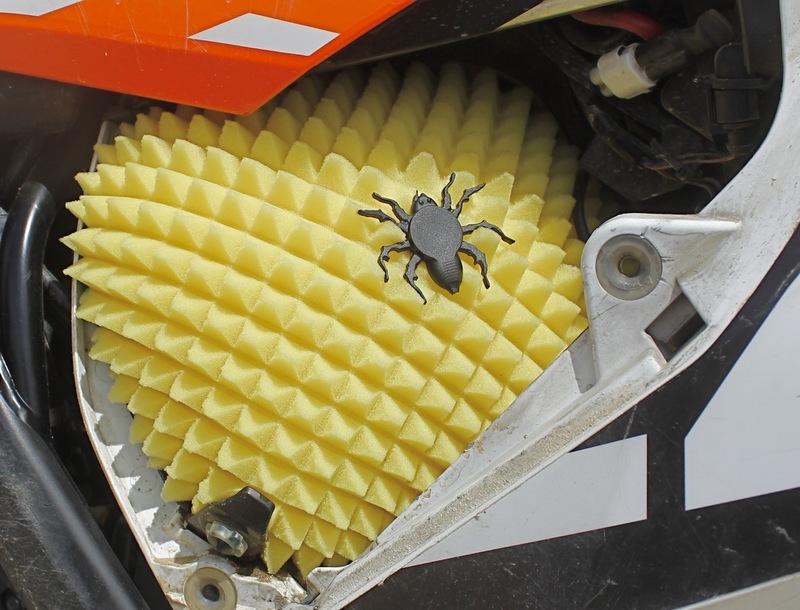 In MXA’s tests, the FunnelWeb air filter did its job well. We tested it in extreme dust and sand at the back of the pack. There were no signs of dirt bypassing the oiled foam. The larger surface area was a plus on the maintenance side of things, but if there was a performance gain over the stock air filter, our test riders didn’t notice it. WHAT’S THE SQUAWK? The foam pyramids can be damaged by rough handling during cleaning and oiling. Since all filters are made of foam, designers can only change density, layers and shape. FunnelWeb’s choices result in a filter that is durable and long-lasting.